Portugal looked like they were going to win Euro2000 until they lost out to France 2-3 in a great semifinal. They crashed out of the 2002 World Cup as one of the favorites, famously losing to the USA 2-3 after conceding 3 goals in the first 35 minutes. They hosted Euro2004 and made it all the way to the final before succombing to the underdog Greeks for the second time 0-1 (they also lost the opening match to Greece 1-2). 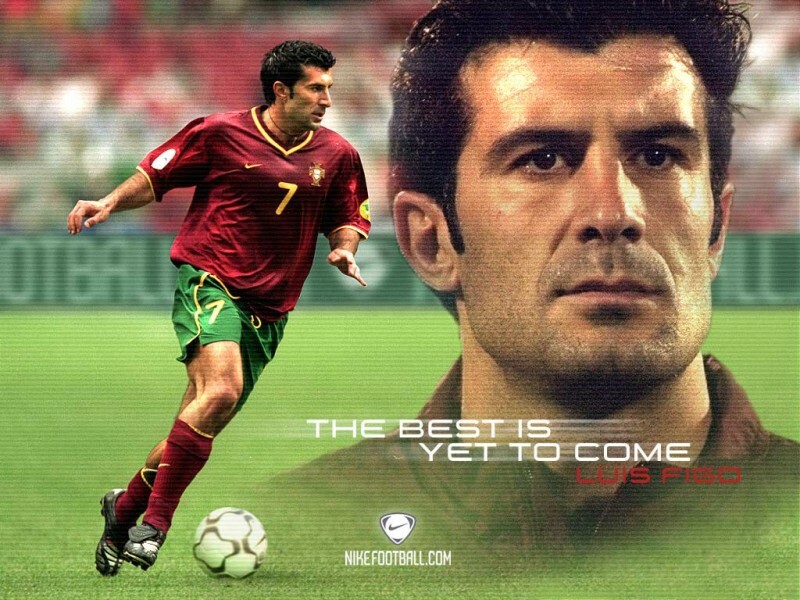 The famous "Golden Generation" of players have entered their sunset years, and the most famous one of all, Luis Figo, will end his international career after this tournament. Former FIFA World Player of the Year, he is by most accounts the 2nd best Portugese footballer of all time after Eusebio. He is literally like a God in Portugal, which is ironic considering his is seen as a Judas in Barcelona, where he became an adopted icon only to move over to uber-rival Real Madrid (check out the reception he got on his 1st trip back to Barcelona - I'm just pissed that video doesn't have the famous pig's head thrown at him from the stands). 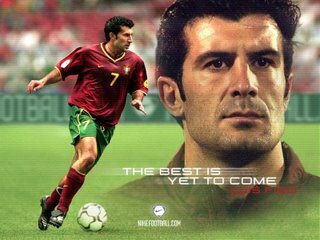 Leading up to Euro2004 I remember reading an article that he was the most recognized and popular person in Portugal, more well known that even the President. He will be up for this tournament as he tries to match his past greatness one last time on the world stage. Christiano Ronaldo will get all the press as Portugal's best player, and he probably is. However, for me their most important player is Deco, the playmaking midfielder who will distribute the ball and get the team into good attacking positions. He has excellent vision and is a very good long passer, and for me he is the straw that stirs their drink (even with Ronaldinho at Barcelona, he plays a similar role there as well, holding everything together and initiating the offense). Interestingly, Deco is kind of a man with no country. 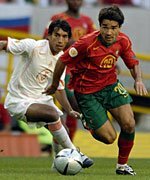 A natural born Brasilian, he controversially chose to play for Portugal using his ancestry, mainly because as he was getting really good there still was not much room for him in the insanely talented Brasil team. Anyhow, in Brasil he was seen as a traitor, and in Portugal he was resented because he was a foreigner and not truly Portugese. But he will persevere, beacuse he looks exactly like Dean Cain, the modern day Superman. I also thnk Portugal has the best looking kits in the world. Don't know why, I just dig them. I like Portugal to cruise through, and at mid-teens to 1 odds, they are a good "value bet" to win the whole thing. They are certainly capable if the breaks go their way in the knockout stages. El Tricolor have only made it to the quarterfinals twice, and both times they were the host nation(1986, 1970). In fact, they have lost more World Cup final matches than any other nation, mostly because they always qualify but historically have been a cut below the European & South American teams. They do have a some good talent though, and an entertaining coach who is extremely controversial and not above cursing at the media and telling them they are idiots. I don't have much to add that isn't being said by everyone else, that they should get out of the group but will need something special to so much further than that. 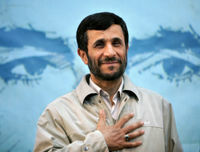 While all the attention is on the brouhaha of holocaust denier & President Mahmoud Ahmadinejad,who is a soccer fan and wants to travel to Germany to watch the matches in person, which has caused an uproar in Germany beacuse he is on record of wanting Israel "wiped off the map" (an especially sensitive topic in Germany for obvious reasons), they can play a bit of footy. Another of several teams that I won't pretend to know alot about since I have never seen them play, I have only read about them. It will be interesting to see what happens with this team, both on and off the field, and I hope that women Iranian soccer fans exercise their human rights to follow the matches - hopefully some of them will even travel to Germany. First time participants, they tied African power Nigeria atop their qualifying group but won out on head to head tiebreaker by drawing away and upsetting Nigeria at home. They are rank outsiders, and for most pundits should just be happy to be here. But as I said, one of the African teams always suprises and does really well, and this group is not the strongest, so you never know. Their match with Portugal will be especially interesting since Angola is a former Posrugese colony. 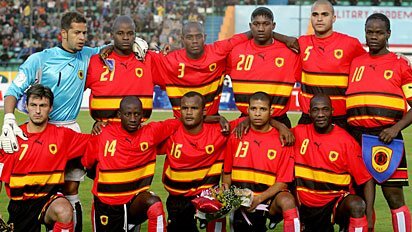 You know Angola will be extra fired up to play against their former occupiers; this reminds me of Senegal playing France in the opening match of World Cup 2002 and pulling one of the all-time World Cup shockers by beating their former colonizers 1-0, setting off their run all the way to the quarterfinals. This group is not the strongest, and Portugal should win it fairly easily. Mexico are favored to grab the 2nd spot, but I wouldn't be suprised if either Iran or even Angola suprised everyone and made it through. I'm sorry, I just couldn't care less about this group. Whoever comes out of this group will be eliminated the next round when it faces off against the qualifiers from Group C. I guess that's the reward for surviving the Group of Death, a free pass to the quarters. Probably won't do much until after the Group Stages, IF Sven is smart (which, we all know, is still up for debate). Rooneh or no Rooneh, at some point Sven will completely get out-coached tactically and substitutionally (if that is a word), and Engerland will crash out because he will not put his players in the best position to win. The trickt thing for England is that McLaren might not be much better. As far as the group, I agree with the other three but not with Portugal. I think they can go places, and I wouldn't be suprised to see them get hot and make a run to the semifinals. Remember they beat Holland in the semifinal of Euro2004 (yes I know it was at home but still). They can definitely hang with the big boys is all I am saying. That being said, whomever wins Group C will get a nice soft match in the round of 16.